Anyway, I thought that since Dr. Suess’ birthday is coming up March 2, which is also when Read Across America happens, and The Lorax movie comes out, I thought it would be appropriate to do a Play post on my favorite Dr. Suess book. And it wouldn’t me enough for me to just say that And to Think That I Saw It on Mulberry Street is my favorite, and I’ve to do more. And so I thought it would be fun to make my own version of the book, only using my street as the inspiration. And so I give you And to Think That I Saw It on Lawrence Road! I started with a picture taken right outside my front window, and then I played! 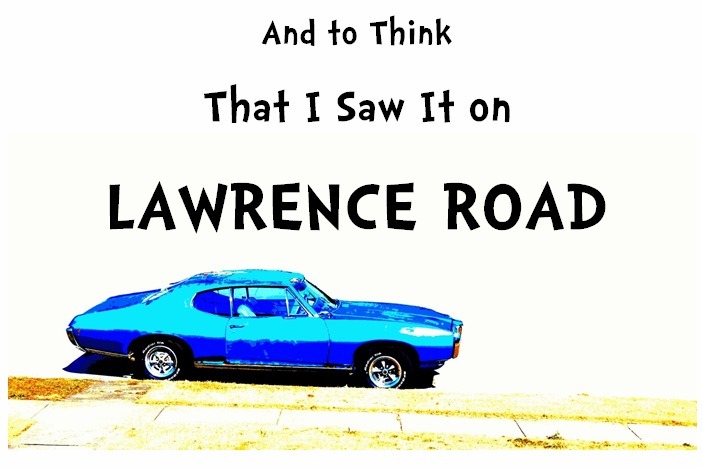 It was really fun coming up with fantastical things that could happen to the old blue car that is ALWAYS PARKED OUTSIDE OUR HOUSE. And it’s not even ours. Just sayin’. While my little boy is a little to young to truly participate, I would imagine this would be great fun for a kid who can draw, or for an older child, one that can use the computer like I did. I did all of this on picnik, but you could use any similar photo editing software. I also added my own Suess-like rhymes. So if you view the slide show, you can see my whole creation. I had a lot of fun doing this. It was a kind of therapy for me since now I can definitely sorta kinda maybe appreciate that car being ever present outside our window. So what is your favorite Dr. Suess book? We linked up on ObSuessed, a collection of Dr. Suess activities and fun!